One of our favorite fall dishes is ham and potato soup. Sadly, potatoes are a huge no-no on a low-carb diet. This soup replaces the potatoes with cauliflower; the creamy cauliflower does a great job thickening the soup and adding a smooth and creamy texture. The tender ham adds plenty of protein to a carb free dinner while the cheese adds just the right amount of salty flavor. 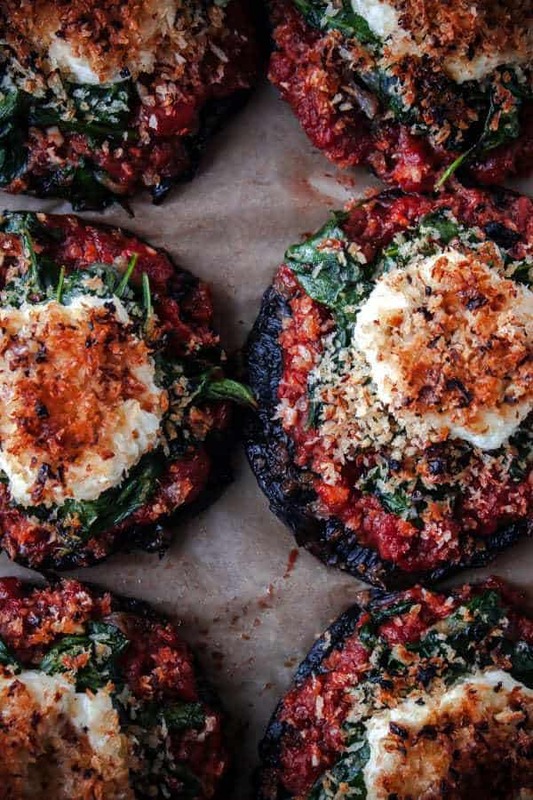 Portobello mushrooms and goat cheese seem to go hand in hand with each other in carb free dinner recipes. Portobello mushrooms love the sharp tang of goat cheese, and goat cheese loves the deep and meaty flavor of Portobello mushrooms. The spinach adds protein and a bright color while the panko bread crumbs add flavor and texture. Tomato paste adds a layer of umami to the mushrooms; the acid from the tomato paste lightens up the heavy flavor of the mushrooms. 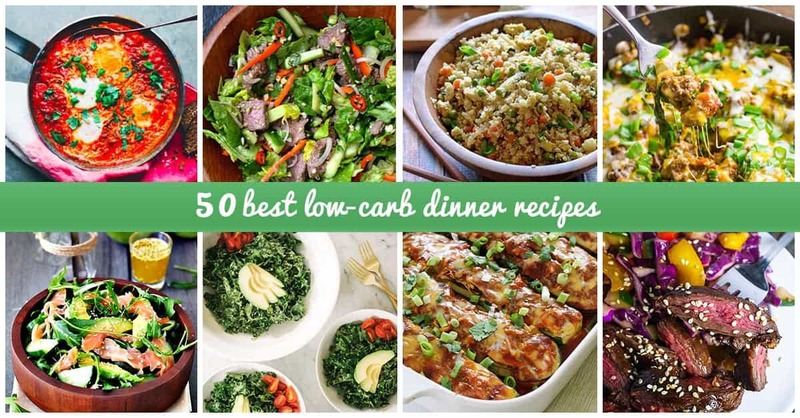 Some of the best low-carb dinner recipes are some of the simplest ones. This recipe highlights the flavors of the ripest tomatoes of the season. The zucchini adds bright color and meaty texture to the dish, and the black olives add plenty of flavors. 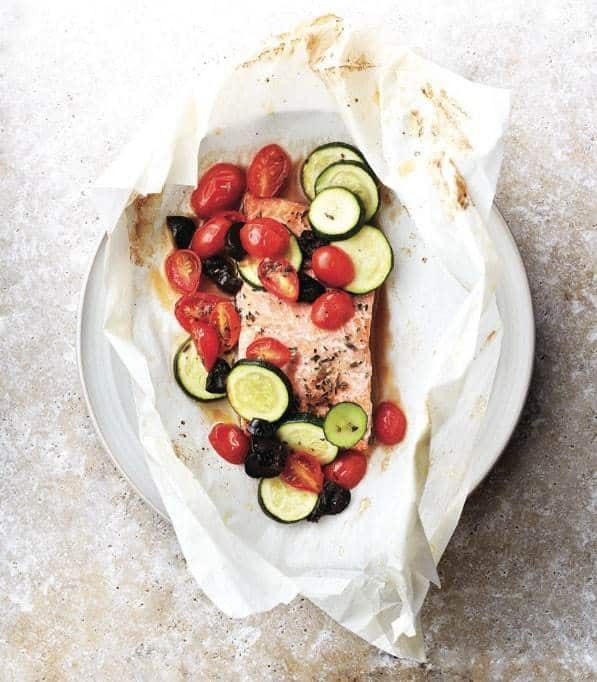 The entire dish is cooked on a layer of parchment paper, so cleanup is easy. Salmon is the perfect dish for any time of year; it’s nice and light in the summer and can “beef up” dishes in the wintertime. These low-carb recipes are made all the better because it is cooked in one pot. Cleanup is easy, and you don’t need to keep an eye on several pans at once. 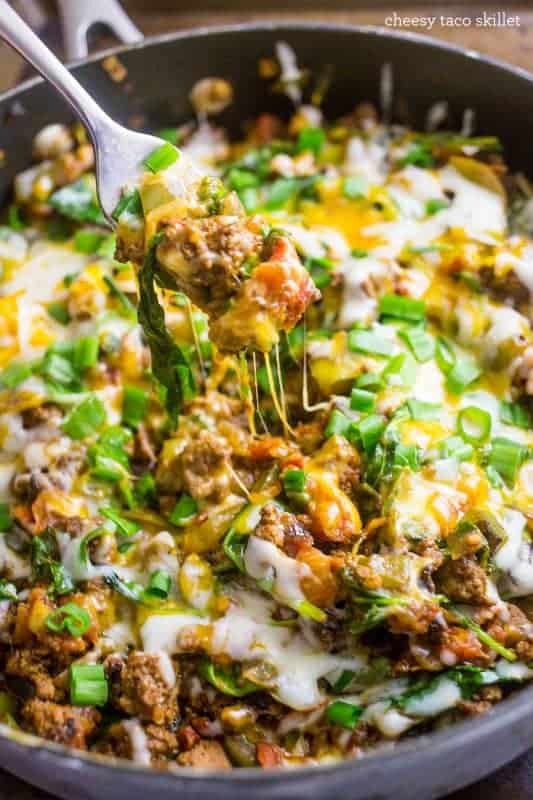 Rich and hearty ground beef is combined with layers of cheese, veggies and taco seasoning. The bright green onions are added at the last minute, so you can still taste their freshness throughout the dish. When it comes to low-carb, the Mediterranean diet has low-carb recipes flavor down to a science. These tacos are bright, fresh and flavorful. They are easy to make and don’t require a lot of prep time. They are reminiscent of the halal carts of New York City without all the added fat and oil. 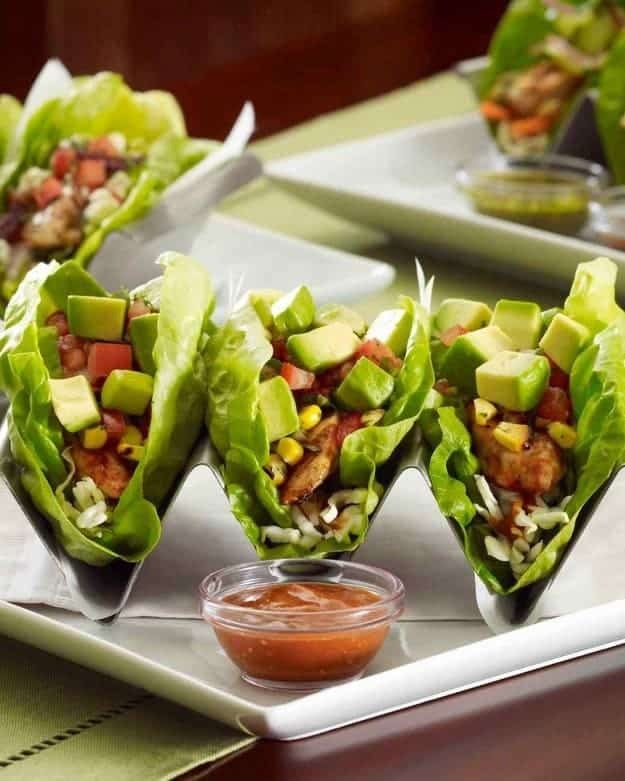 The bright romaine adds so much crunch; you won’t even miss the tortilla. The Kalamata olives add tang while the creamy tzatziki adds flavor and some smooth texture to a carb free dinner. 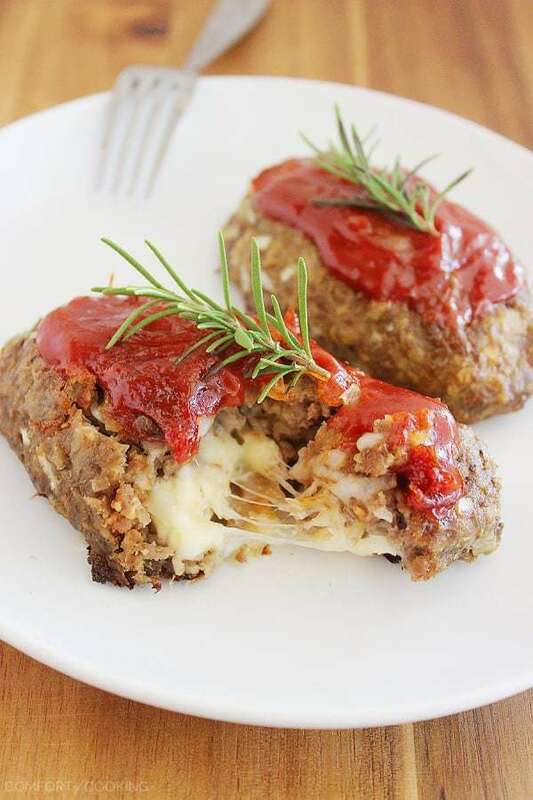 The hardest part about eating meatloaf is stopping when you’re full. These mini versions of the American favorite are flavorful and filling. They come in little individual loaves, so you won’t feel tempted to pile on slice after slice. The use of string cheese is creative and carves off several minutes from the prep time. Add a sprig of rosemary to add a woodsy aroma. We could all use a little more of the good fat in our lives. This recipe gives us plenty of options for omega-3s with ingredients like salmon, avocado and leafy greens. 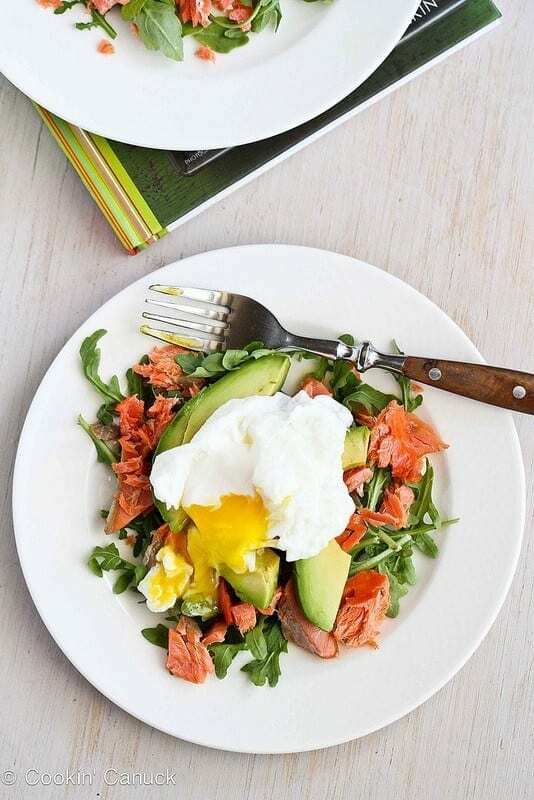 The poached egg adds a little protein and heart-healthy fats that are needed to lose weight on a low-carb diet. The egg yolk acts as its own condiment; simply crack open the egg, and you’ll have a runny yolk to dress the arugula and avocado. Poach the egg in water with a little vinegar for an added tang of flavor. 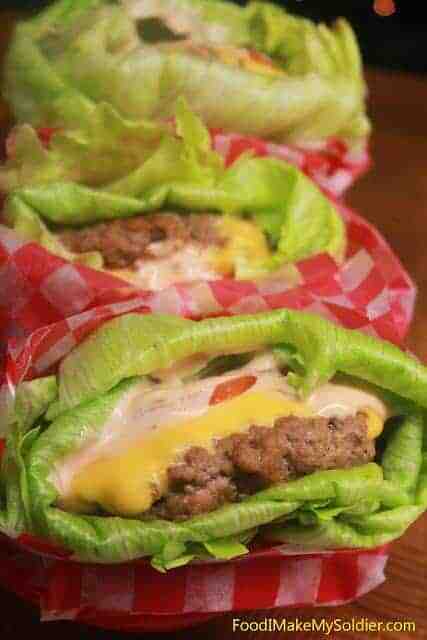 Who doesn’t love a juicy cheeseburger in the summer? Who doesn’t love a juicy cheeseburger in the winter for that matter? 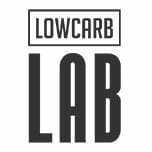 A low-carb dinner can also become a low carb fast food dinner; you simply must modify them into low-carb food. You won’t miss the bun in this recipe because the decadent “secret” sauce adds so much flavor that you won’t remember a time when you didn’t eat your burgers tucked in a lettuce hug. You say frittato, and I say frittata. Frittata is one of those superfoods that you don’t need carbs to enhance. 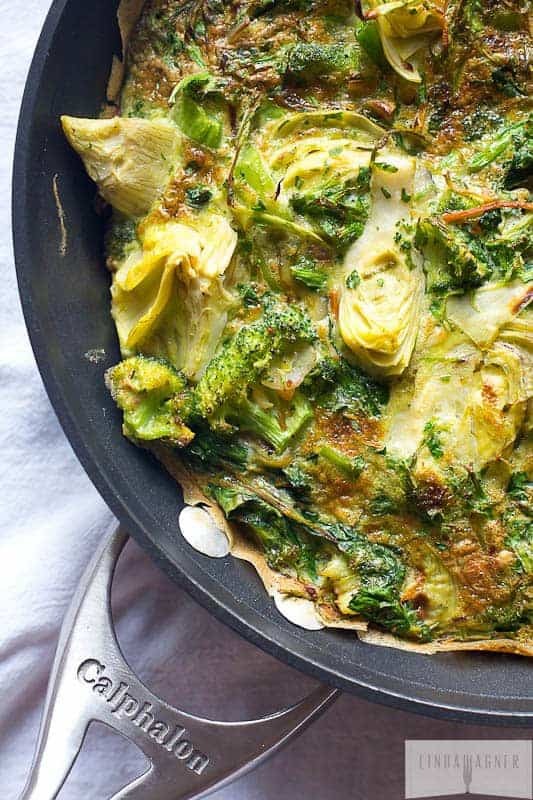 The broccoli and artichokes crisp up so nicely in this dish, you won’t even miss potatoes with your morning eggs. The goat cheese is tangy and creamy and holds the whole thing together quite nicely. The best part of this dish is the nutrition factor. It’s loaded with tons of omega-3s, vitamin E and beta carotene. You don’t need to modify frittata to make it into a low-carb food. The only activity more fun than saying “rocket arugula,” is eating rocket arugula. 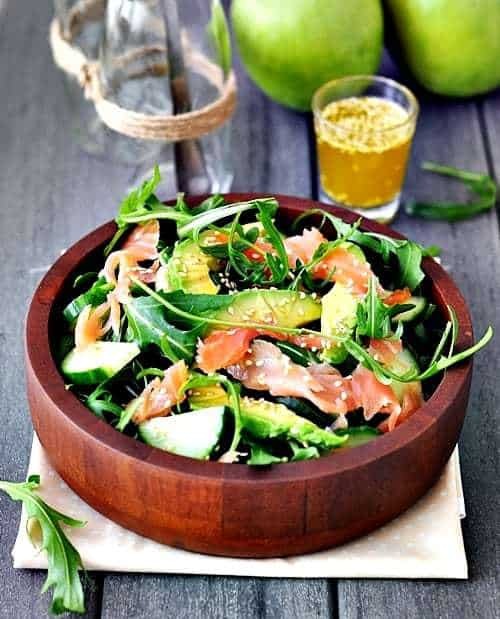 This is a lovely light summer salad that is topped with bright green chunks of avocado and delicate strands of pink smoked salmon. The cucumbers and sesame seeds add a nice crunchy finish. The dressing is made from sesame oil that lends the dish a nutty undertone. The lime in the dressing cuts through the rich flavor of the sesame oil and adds a bright finish to the salad. An easy and healthy dinner that also looks pretty is a bonus. You might have thought your Chinese food days were over when you went low-carb. This recipe proves that you can have your Chinese and eat it too. There is such a thing as Chinese low-carb food. Skirt steaks are great because they are relatively inexpensive. This skirt steak comes out juicy and tender thanks to the marinade. The yellow bell peppers add bright flavor and color; the Sriracha adds a nice dry heat without too much spice. These low-carb recipes prove that cheese and sauce make everything better. Instead of carb-laden enchiladas, treat your family to a dish that’s both flavorful and nutritious. 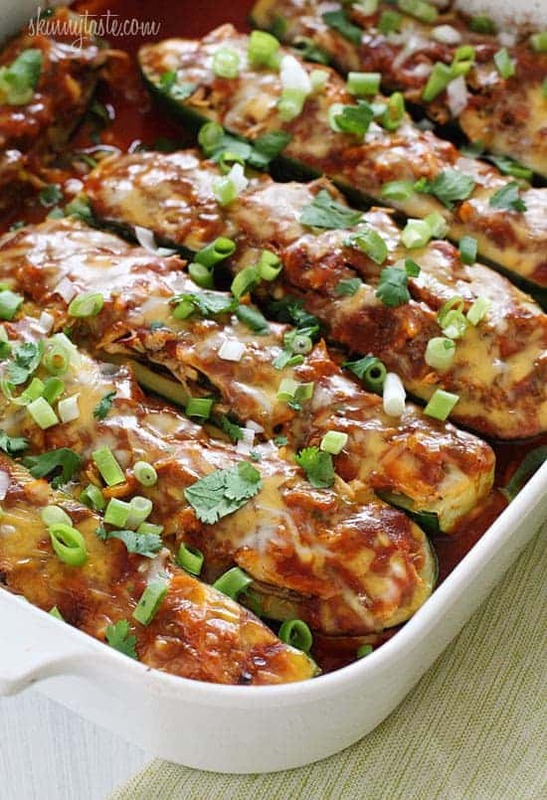 The zucchini boats are tender and can be cut with the edge of your fork. The chicken adds tons of protein and texture, and the enchilada sauce that’s added to the bottom of the pan gives the dish plenty of spice. A thick layer of cheese blend is just the thing to keep all the ingredients in their places and add an extra layer of flavor. Zucchini “noodles” are such a versatile ingredient. They taste pretty darn close to wheat or rice noodles and add a lot of nutrients. 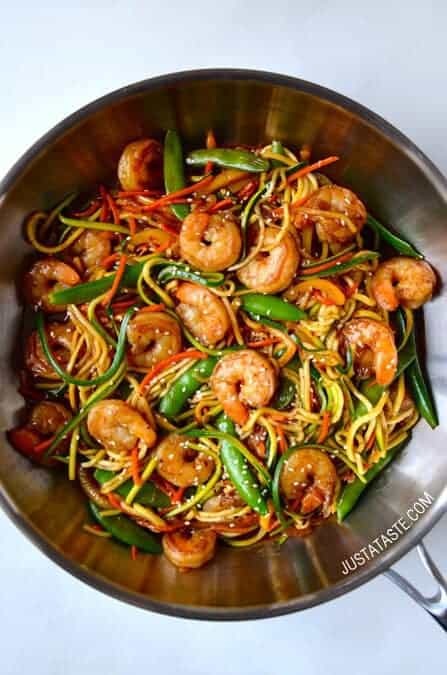 This recipe is fantastic because the shrimp adds a great texture to the dish. When cooked right, the shrimp should pop between your teeth. The texture of the snow peas mimics the shrimp’s texture; you almost can’t tell the difference between these two similar ingredients. Yellow bell peppers and green onions add an extra bout of color without a ton of calories on your low-carb diet. No one should ever ask you to go on a diet that banishes pizza from the menu. This no carb dinner “pizza” makes use of a frittata for its crust. The eggs add plenty of omega-3s and give the crust a lighter texture than most pizza crusts. Eat this dish with a fork and knife, or dig in and eat it with your hands. 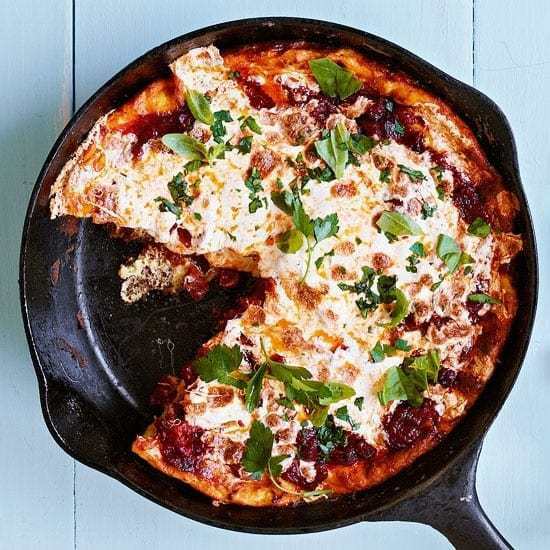 The tangy tomato sauce seeps into the eggs a little and lends more flavor to the crust. The soft mozzarella is gooey and clings onto the eggs and sauce in the same way it would on a traditional pizza. Save this recipe for next year’s Super Bowl for low-carb recipes. Chicken wings are notoriously packed with fat and cholesterol, but these lightened wings rise to the challenge. 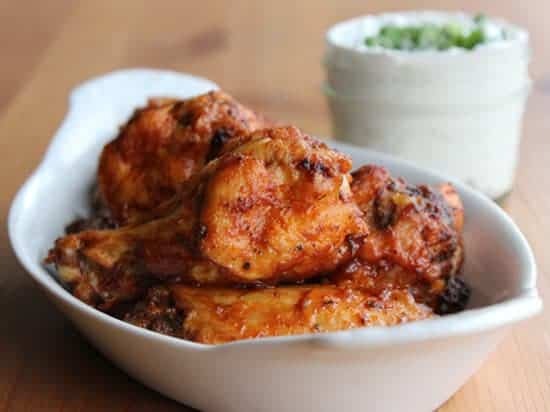 You don’t exchange flavor for nutrition with this recipe though; these wings are doused in spicy buffalo sauce before they’re baked in a 375-degree oven to lock in flavor. Blue cheese yogurt adds a little tang and lightens the flavor even further. 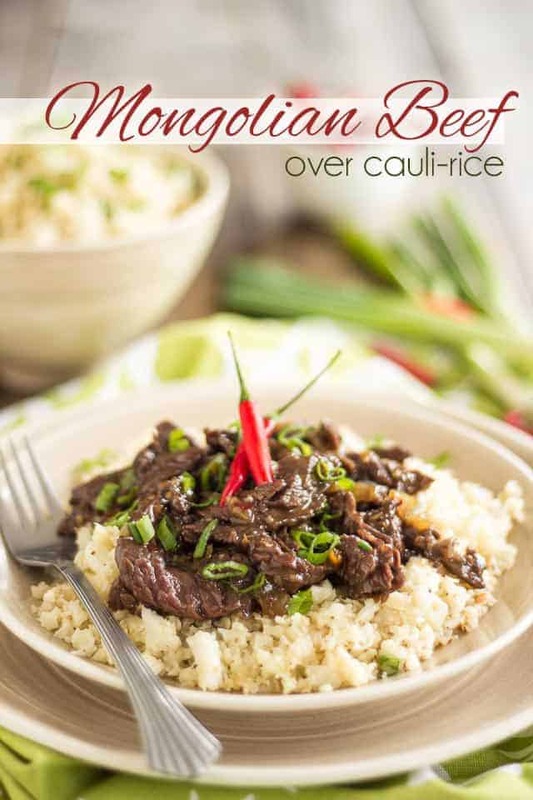 You don’t need to travel halfway across the world for flavorful Mongolian beef. This recipe can be cooked from the comfort of your own home in one pan. Seared onions add tons of flavor to the sautéed beef. Sesame seeds and olive oil tie together flavors in the cauliflower “rice.” Red pepper flakes and fresh chilies add a low heat that you can control. 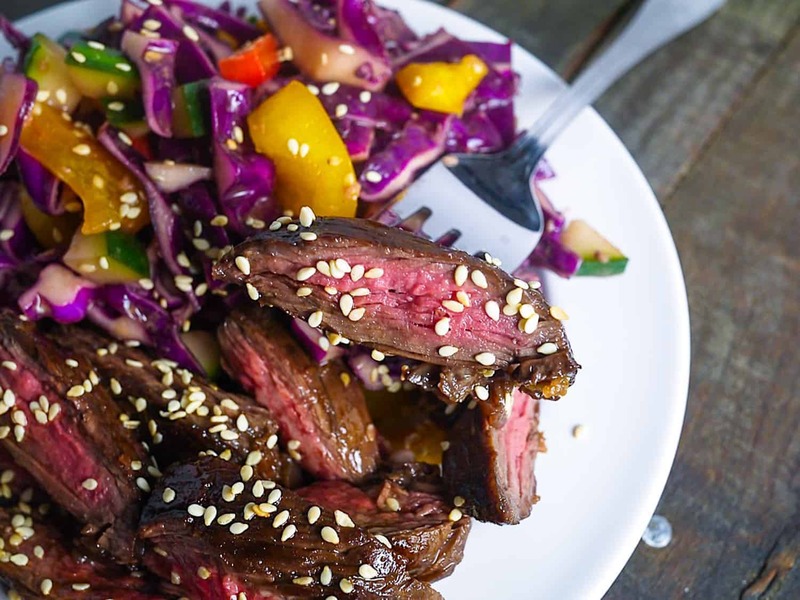 Dinners are a major meal within the day that you shouldn’t joke with, check out these tastiest Paleo dinner recipes that are perfect for the whole family. 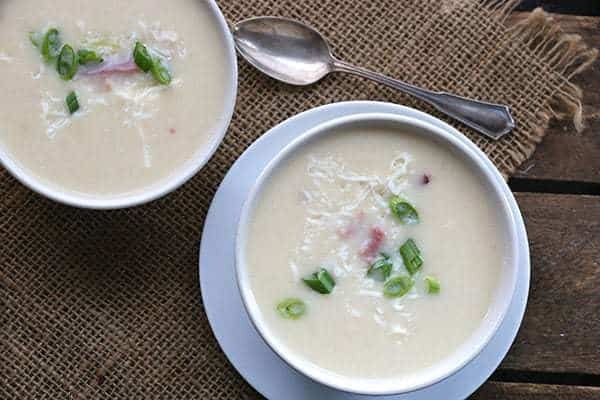 This recipe tastes dangerously close to your favorite restaurant bacon, cheddar and potato soup. Yet you won’t find any potatoes in this decadent lunch. This hearty soup is full of low-carb foods and gets its ultra-rich consistence from the potato’s lower carb nemesis, cauliflower. Flavor is added to the soup layer by layer. Diced celery and onion powder are the base of the flavors and mirror the complex flavors of the traditional mirepoix. Two percent milk is added instead of cream. 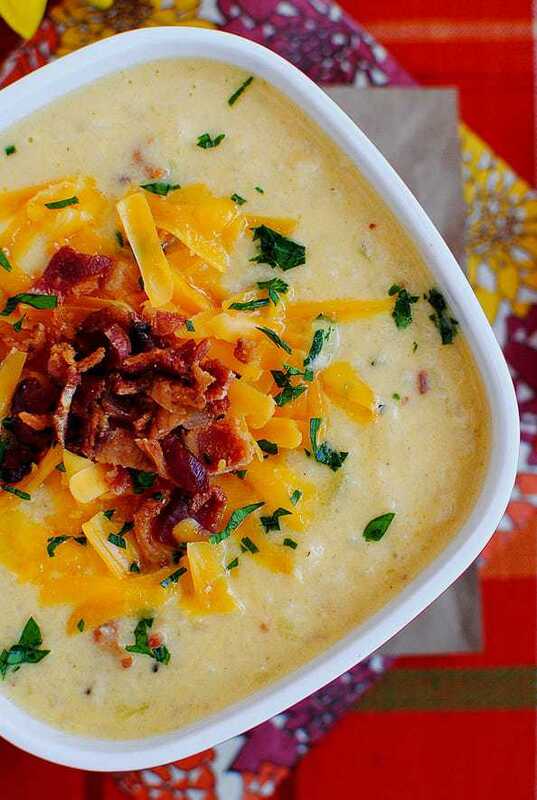 Hearty chunks of bacon and grated cheddar cheese give this soup its signature taste. This is one of the best no carb recipes for dinner. Anyone who grew up in the South can tell you that pimento cheese reigns supreme south of Maryland. This lighter version of the mayonnaise-laden southern favorite will cure your craving for the uber fatty dip and is one of the yummiest low-carb recipes. 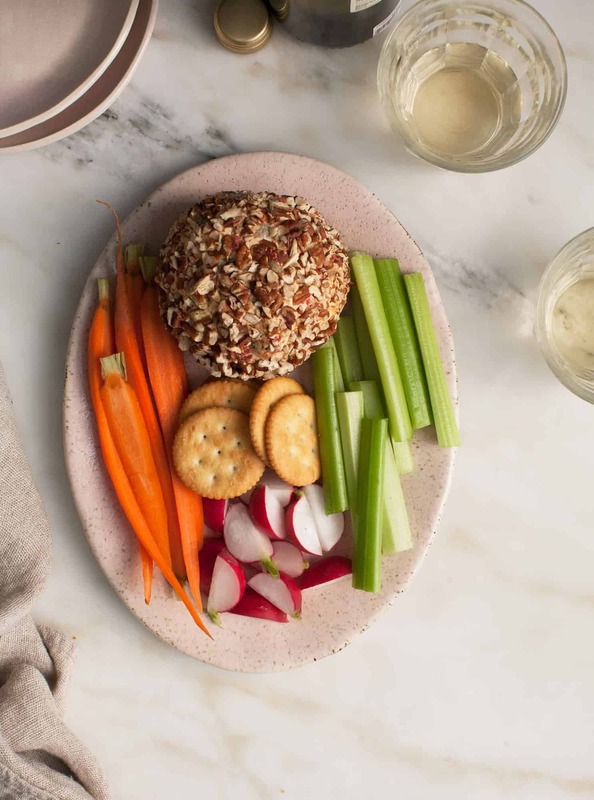 Cream cheese is used instead of mayonnaise here and gives the cheeseball the sturdiness it needs to hold up in the fridge. The deep flavors of the pimento peppers are still familiar paired with the bright tang of the cheddar cheese. Pesto pasta is one of the great guilty pleasures in life. Carbs plus oil equals happiness for some reason. 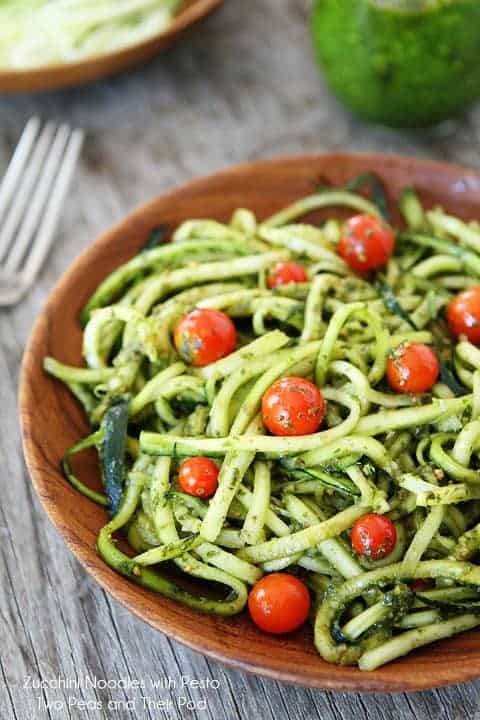 This pesto zucchini “pasta” has all the pleasure without the guilt on a low-carb diet. Zucchini ribbons replace the carb-filled noodles. The pesto is made with plenty of good olive oil and basil at the peak of freshness. Bright red cherry tomatoes add a punch of color at the end.